Progressive cell loss in neuronal populations is a pathological hallmark of neurodegenerative diseases (Jellinger and Stadelmann, 2001) . Discovery of neurotrophin opened up a large and promising investigation field and they have been used for the treatment of several neurodegenerative diseases. The development of new compounds which can mimic neurotrophin effects and have drug-like propertises appears to be a promising strategy for the development of new therapeutics in neurodegenerative diseases. 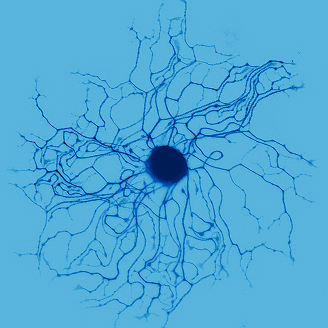 In addition to promoting neuronal survival, neurotrophins are also involved in neuronal differentiation and axonal outgrowth. 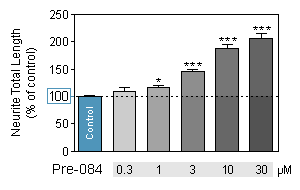 Neuronal survival assay and neurite outgrowth assay are used in neurobiology to study the neurotophic effect of a new compound. 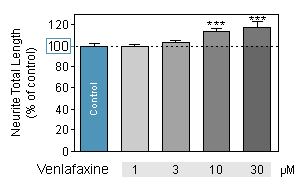 Neurofit offers several models to test the neurotrophic potency of a compound on rat primary neuronal cultures. Measure of neuritogenesis including neurite outgrowth is instrumental for the screening of neuromodulatory, neuroprotective, neuroregenerative as well as neurotoxic effect of compounds. Venlafaxine (Effexor, Lanvexin, Viepax or Trevilor) is an antidepressant of the serotonin-norepinephrine reuptake inhibitor (SNRI) class. 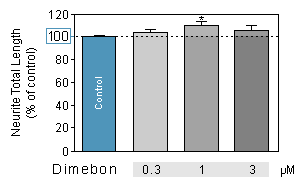 Venlafaxine significantly promotes neurite outgrowth in a dose-dependent manner but in a lesser extent than SSRI or TCA. Fluoxetine (Prozac or Sarafem), a selective serotonin reuptake inhibitor (SSRI) is the most prescribed class of antidepressant. 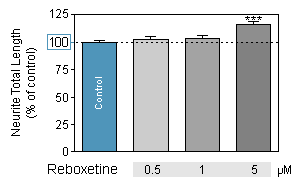 Fluoxetine dose-dependently increases by up to 80% the neurite growth in cortical neurons. Amitriptyline (Elavil) is tricyclic antidepressant (TCA) used to treat major depressive disorders. Reboxetine (Endronax or Prolift), a norepinephrine reuptake inhibitor (NRI) used to treat unipolar depression. 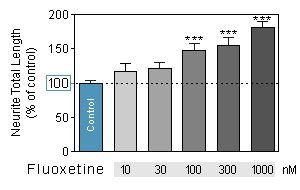 Reboxetine promotes significant neurite growth although the effective concentration window is narrowed by side effect observed beyond 5µM. PRE-084 is a sigma receptor agonist, selective for the σ1 subtype. It has antidepressant and memory enhancing effects in animal studies. 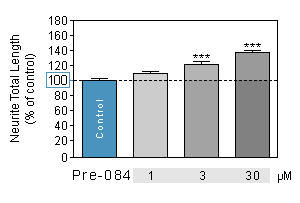 PRE-084 increases the expression of GDNF. 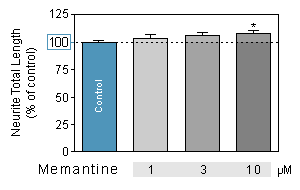 Memantine is used for treating Alzheimer-type dementia. 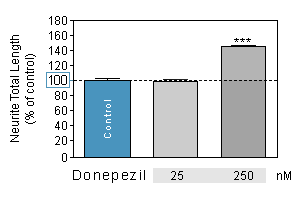 Memantine is an (NMDA)-receptor antagonist. 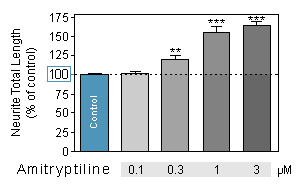 Memantine works by blocking excess activity of glutamate. Dimebon inhibits brain cell death in animal models of Alzheimer's disease and Huntington's disease. Multiple mechanisms of action: blocking the action of neurotoxic beta-amyloid proteins and inhibiting L-type calcium channels, modulating the action of AMPA and NMDA glutamate receptors. 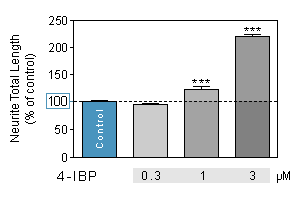 4-IBP is a σ1 Receptor Agonist. Donepezil (Aricept®) is a centrally active small molecule used in the treatment of Alzheimer’s disease and different cognitive disorders. 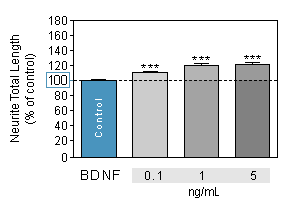 Effect of reference compounds on neurite outgrowth in spinal neurons culture. 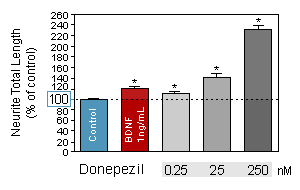 BDNF is a member of the neurotrophin family of growth factors. BDNF acts on certain neurons of the CNS and the PNS, helping to support the survival of existing neurons, and encourage the growth and differentiation of new neurons and synapses. 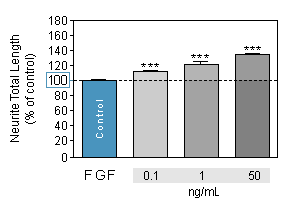 FGFs are a family of growth factors involved in angiogenesis, embryonic development and various endocrine signaling pathways. PRE-084 is a sigma receptor agonist, selective for the σ1 subtype. It has antidepressant actions in animal studies. 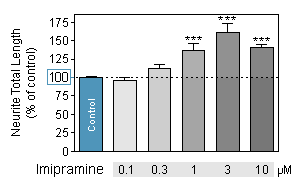 PRE-084 increases the expression of GDNF. Progressive cell loss in neuronal populations is a pathological hallmark of neurodegenerative diseases.